On the Right Bank of the Dordogne and Garonne rivers, 35 km North of Bordeaux (and 20 km via the river). 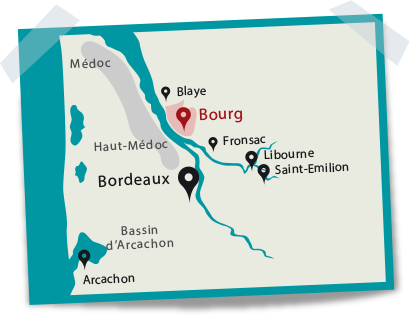 The Côtes de Bourg vineyards stretch over 15 communes, all within the same administrative district. Terroir consists of all the factors that make up an ecosystem: – Soil and subsoil (pedology and geology) – Climate – Topography – History – Plant material (grape variety and rootstock) – and the winegrower’s work in the vineyard! A mesoclimate reflects the influence of a specific geographical area on its climatology. (a higher sum of temperatures equivalent to Sauternes, Pessac Léognan, Margaux, and Saint-Emilion), – 10 to 25% less rain depending on the year.The Gironde Estuary acts as a thermal buffer (protecting the vines from frost in 1991, for instance). Historians date winegrowing in Bourg from around the 2nd century AD, when Romans planted the first Vitis biturica vines – the ancestors of today’s Cabernet. Bourg harbor was used to ship the local wine in the Middle Ages, and vineyards along the estuary grew to keep pace with increasing demand and trade along the river. One of the oldest AOCs in Bordeaux: – The Côtes de Bourg, Bourg, and Bourgeais appellations were created in 1920 – The official government decrees confirming the Appellation d’Origine Contrôlée (AOC) were signed on 11th September 1936 for red wines and 19th May 1945 for the whites. Limestone bedrock in the Côtes de Bourg can be as much as 20 metres thick. This is covered with a thick layer of clay that becomes thinner as one goes eastward. Red gravel from the Massif Central carried along by the river was deposited on rises during the Pliocene Epoch. Very specific to the Côtes de Bourg, this soil type is found on rises due to its origin: hydro-eolian silt from the Würm glaciation. It is easily recognisable thank to its sienna-red colour. Merlot and Malbec are most often planted here. Deep rooting makes up for a certain lack of organic matter and low water retention potential. This is the predominant soil in the Côtes de Bourg. Some scientists explain their presence as “the remains of a sublacustrian delta”. Both Merlot and Cabernet are planted here according to the natural richness and rooting depth of specific plots, which can vary a great deal. This type of soil is fairly widespread due to the parent rock called Molasse du Fronsadais, recognisable thanks to asteriated limestone from the Stampian Age. Merlot is mostly planted on these soils with more shallow rooting and greater water retention. This name reflects the appellation’s hilly topography, since the French word côtes means “slopes”. This variety has been closely studied in the Côtes de Bourg for over a decade (thanks to the Association de Développement Agricole et Rural and the Mercier vine nursery). Since 2007, mass selection has obtained a “Côt de Bourg” (a play on words, because Côt is another name for Malbec) well-suited to Bourg’s terroir. Planting of an experimental plot with 20 different clones in July 2009. Grapes were first harvested here in 2014.